Since I turned vegan we have been having less butter, less fats. It just seemed a natural transition – I stopped making as many cookies, cakes and buttery breads as I did earlier. This also resulted in a temporary phase when I looked a lot slimmer to everybody in general except the daughter. And then, Navratri came along and proved that it was all a mirage. I am back to my ‘durust tandurust’ (hale and hearty) phase, and I know that this phase is always the long lasting one! Meanwhile the ‘off butter’ phase became a bit of a bore – so I decided to indulge myself a bit – that explains the dhingri badaami and the ‘rich’ posts that will follow. Coming back to buttery topic, the brioche pronounced as ‘bree-oshe’, is argued to originate from France or Rome, but my own experience with the amount of butter that went in and the kneading technique brought the dough closer home – it is exactly like the authentic Punjabi bhatura dough – filled with butter rather than oil, so much that your finger should sink in if you poke the dough slightly. The resemblance ends there – while the rich brioche dough is baked in a double row, the bhatura dough is deep fried making it even richer. Like its Asian cousin, the brioche too is light, and you could very well use the dough for a ‘not so rich’ tart like Susan of Wild Yeast. Another reason – the real reason – why it took me so long to make these breads was that I did not have the fluted brioche moulds. After that long introduction into the how and why of me eventually making a brioche, here are the major changes the bread went through; The butter was replaced by vegan butter, and the eggs by silken firm tofu beaten like crazy alongwith soymilk. Note: As you incorporate the butter into the assembled dough you might find it becoming extremely sticky and doubt whether it is too much, but keep on and do not add extra flour. After ten minutes of kneading the butter in, the dough will become smooth and elastic. Active dry yeast – 1 tsp. Silken Firm Tofu – I just scooped out about 4 heaped tbsps. Caster sugar – 1+1/2 tbsps. Vegan butter spread at room temp. – Approx. 90g. Mix yeast with 1/4 cup lukewarm soymilk and leave till frothy. Sieve the salt and flour together. Stir in the caster sugar. Buzz the tofu with extra soymilk till silky smooth. Make a well in the flour. Add the tofu mixture, and the yeast mixture and bring together into a loosely assembled dough. Tip on to a floured working surface and knead well. Incorporate small amounts of the butter in portions and keep kneading. This makes the dough very sticky. You might feel like adding flour but do not. Just keep at it till forms a smooth soft elastic dough. Place it in a greased bowl till almost double. Mine took nearly 2 hours to raise. Meanwhile grease your brioche moulds, or the loaf tin. I was able to make 14 tiny ones. The average yield if you make enough in 2″ fluted moulds should be ten, but I baked this for the short break, and wanted tiny ones, which is why the base is not very much grooved. Pick small pieces of the dough and make round lumps big enough to fit the base well. Pick smaller pieces of the dough and make small spheres to rest on top of the lower sphere. Pass a greased wooden skewer or shashlik stick down the centre of the top sphere to join it with the lower sphere, and remove the skewer. Do not pass it completely down to the lower sphere. This secures the two spheres. Brush them with a warm glaze of 2 tbsp. soymilk with 1 tbsp of sugar, and leave to raise for about an hour till well risen. They do not double in volume but puff a little. Preheat oven to 220 deg. Cel., and bake for about 25 to 30 minutes or till well browned. I usually bake in the lower rack for 20 minutes and then transfer to the top rack and bake for another 10 minutes. The time taken depends on the oven. Rotate in between to avoid burns. It was a happy pleasurable bread baking experience, and this one is going to be repeated very soon for a whole wheat tria. I also managed to save a small amount of dough to try Susan’s tart with some other fruit. Are you sure Nutralite is vegan? It has skimmed milk powder. But this article was in 2008; maybe the ingredients were different then. You are right, Dheeraj. I had used nutralite for nearly 4 months before realizing it was not vegan. In the beginning I even used dalda/margarine once or twice but the health aspect worried me so much that I got rid of the pack immediately! After that I shifted to olive oil or coconut butter. That sure is a cute looking bread. Oh, these are so cute. Never thought of it till you mentioned it, but Thalayattu bommai is right! Going Vegan has been on my mind for sometime! Great you did! This bread looks amazing. Thanks, Simran! I suppose it is on the West. I will keep a look out when I go there next! I know what you mean – I always buy things I don’t need at Arife! The Andheri store is right opposite Andheri station. You have a great blog here and I’m glad that I visited.This bread just looks lovely and tempting…very good creation indeed! Laavanya – ‘quack quack’;) Yes, I agree! 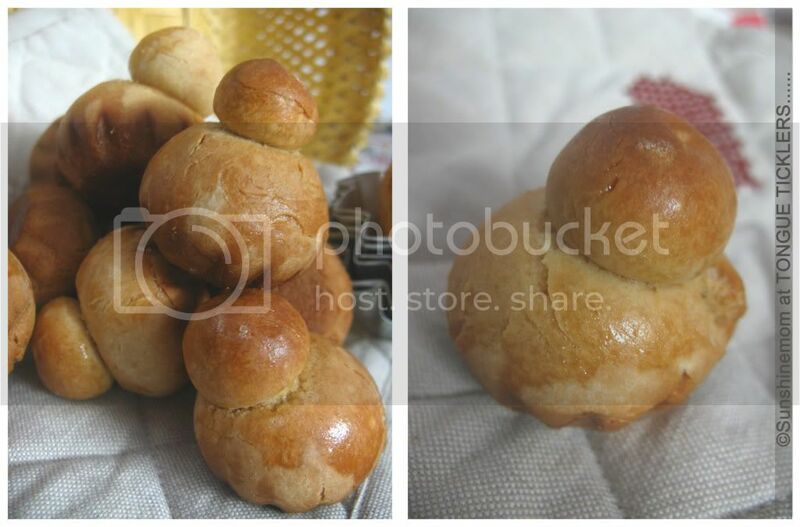 Wonderful brioche and a great example you can bake them vegan! What beautiful brioches! Very tempting! Simran – I guess its all about ‘the will finding the way’ esp. when it is matters related to the tastebuds;) and hey! I did not know about Arife’s shop at Andheri, and I worked there for 3years!! Where is it? In fact I am right now on leave due to a back problem after picking up too many things at Arife!! Usha – Yes, they did taste great. A lovely, lovely bread, Harini. Congratulations on a superlative job! Vegan brioche indeed: that truly is an achievement. Lovely brioche….I can not believe those are vegan. Love the comparison between the bhatura and brioche.I have eaten neither since many years :-(, I’ll take the oven baked goodies over the deep fried one any day. I love the way you find vegan ways for everything. And isn’t Arife the best store in the world. I usually shop at the one at Andheri station, and it always seems like Aladdin’s cave. You never know what treasure you will find in the next row. Sharmila – A telepathic answer maybe!! Sweatha – Hey! Good interpretation. Yes! I know it can be! Most breads can for that matter but I will wait for yours – making it for Madhuram’s event? Yasmeen – Welcome! Thanks for coming over – Stay and have a few of them:) And do keep visiting! Vegan brioche looks irresistibly good, Sunshine mom:). Super job,yes,tofu has to be beaten like a maniac.Actually this is threapeutic,we can vent our suppressed anger on anybod,evrybody on tofu.On a serious note bookmarked.and monkey bread can be veganized,it is next on my list. Sukanya – You said it like my son! He too thought they would taste like heaven with strawberry jam. Uma – Yep, cute they are:) Thank you! Susan – Thank you so much!! What perfect little beauties, no wonder you could not resist! aaaw! these little breads look soooo cute! Like the name too. looks awesome. I was looking to give a try for a brioche 🙂 Which I love of course, but many recipe call for a starter and I don’t have such a patience! Excellent vegan version we could at least have without any guilt ! Post made a good read. Brioche looks very tasty. Tala aati bommai comparison is too good. Great presentation. This is a very nice recipe. Looks so good. Love to have brioche with some strawberry jelly. Nice pictures. YUM!